Labrador Violet is a low growing ground cover with light green to deep green to purple-black leaves. It will bloom with lavender flowers from spring through early summer. Labrador Violet will grow from 1" to 4" tall and from 12" to 18" wide in a clumping manner. Plant in part shade to full shade in moist, well drained soil. 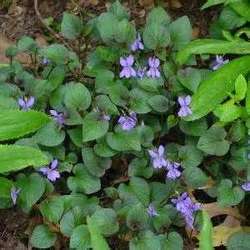 Plant Labrador Violet as a ground cover, in a Woodland Garden, shady part of a Rock Garden, Miniature Garden, in topiary, or in a container. It is deer resistant and also works as a lawn substitute tolerating moderate foot traffic.